I want to get into making chairs and I want to buy a Vesper Tools 7" Sliding Bevel. If any of you guys own one, what do you think of it? Is it worth the extra money to get a Signature Series one? I haven't indulged, but they are beautiful. I will say, the chair will probably turn out the same regardless of which sliding bevel you use .. but I can't fault you on your choice of quality - Vesper makes awesome tools. I own a couple Vesper bevels. I like them a lot, would buy one again. As far as the Signature Series goes... It's my understanding that the major differences are the infill species and the fit and finish. Given how nice the standard ones are I'm not sure how the fit and finish can be improved?? Still, If it were me I'd be inclined to do the upgrade. Hope you're not in a rush. Rumor is, he's months behind in production. 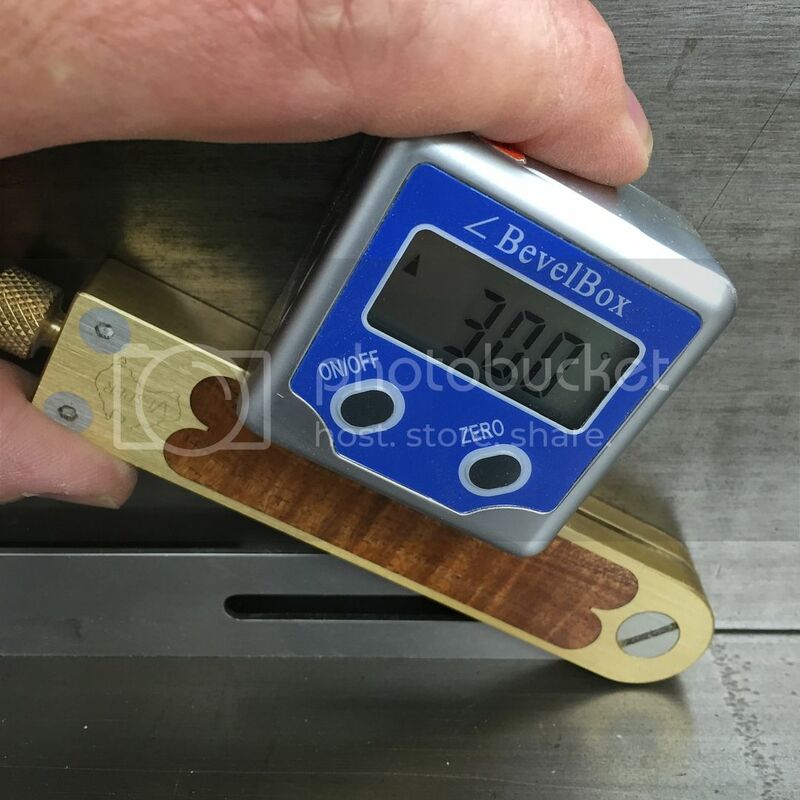 I placed an order for the Signature Series 7" Bevel. Now it's just a waiting game. While you're waiting pick up the original version. I've actually been on the fence with the kits ... https://www.vespertools.com.au/index.php?page=shop.product_details&flypage=flypage.tpl&product_id=80&category_id=12&option=com_virtuemart&Itemid=34 ... but at a point a while ago I started buying some Colen Clenton stuff http://www.hntgordon.com.au/colen-clenton-marking-out-tools.html but sadly he doesn't make a matching sliding bevel. I have a colen clenton cutting gauge and that is the most amazing tool it just works beautifully. My comments may be a little biased as Chris Vesper is a good friend of mine (and he produces marking knives I designed), but it also means that I know all of his products very well. They are the real deal. I would consider him the foremost woodworking tool manufacturer for marking tools, period. I have owned Colen Clentons squares as well - still have a few - but Chris' are in a different league. The Signature range only differs from the Standard (infill) range in the woods that are available and that it is signed. Otherwise they are the same tool. I have the standard versions in 7" and 4". They are just superb. (I have the Stanley #18 as well - excellent sliding bevel. Works well, but no where near the quality, solidness and feel of the Vesper). His squares are exceptional. They are essentially machinist squares with infill. The stainless steel blades are never going to move out of alignment. I have the 7" and 4" versions ..
Notice the little tab on the end of the square. What it does is balance the square on a board when it is butted up for marking. It slides away when not needed. The locking mechanism on his bevel is excellent & it has a really nice feel in the hand, my only disappointment was the blade wasn't flat along its edge which while only a few minutes work on some abrasive sorted that, it's not what I expected with a tool at such a premium price. I ordered the bevel with Black Red Gum, but Chris emailed yesterday and said that he can make it out of any wood that he has. Now I'm on the fence on what type I want. Any suggestions? What looks the best? Any pics of your bevels with different type of wood? I like the standard Tasmanian Blackwood (shown in the picture above). The Black Red Gum is .. well .. black. Boring. OK, its a 1000 years old. But still bland. The Tassie Blackwood shimmers. Gorgeous. And cheaper. Equal choice is the Boxwood. Calming. Clean. Simple. I decided on Ringed Gidgee. It's going to be a long 6 to 9 months. Did Vesper Tools go out of business? I just tried going to their website and I got an error. He's a toolmaker not a webmaster. Probably just a temporary snafu. Chris (Vesper) stayed over with us a couple of months back. He is definitely in business for the long term, having moved to new, larger premises a few months earlier. Having to renovate and outfit the new factory, largely on his own, has put production back some months. Also, he planned to be at WIA. After this, I imagine that he will back trying to catch up on orders. I'm curious to know what happened with your bevel and it's blade not being straight. You should have told me about this. I'm curious to know more and I hope you haven't changed it to mate to a master that is perhaps not straight or flat. I grind these blades myself on my Jakobsen surface grinder and this machine is confirmed to grind flat and straight to 1 micron over a much bigger area than one bevel blade. So I take this very seriously that there might have been something wrong with it. I make my tools to a standard not a price and I make them for people who are sick of all the other junk out there and want the very best quality. Please clarify the non straightness - Was it the edges of the bevel blade (the important bit) or the larger faces. Sometimes the blades are bowed very slightly along their faces, as long as this does not interfere with the work required of a bevel this is acceptable, but it has to sub 0.5mm for this to be acceptable. The edges however is where its all at, they need to be both straight, but very important parallel as well. I make them so, to within sub 0.01mm, the surface grinder and my skill easily achieve this. It seems very unlikely to me that my bevel blade left the works with a blade not being straight. I hope in your fixing of it you have maintained parallel on the edges too. Looking forward to hearing about it if you would entertain me on this! Vesper Tools: made and function beautifully!